This is not because we have fallen away as apostates, but it is hapless condition of human beings: We need constant refreshing and reminding that we are the recipients of a truly amazing inheritance. Meeting weekly as a body of believers is one way to remind us of the riches that we have in Christ, but repetition doesn’t always do the trick. In 1947 J.R.R. Tolkien’s essay “On Fairy-stories” appeared in a collection published by Oxford University Press. This essay put forth Tolkien’s vision for what fairy-stories2 were and what benefits they could bring to readers. One of his main points included the concept of “recovery.” According to Tolkien, we need to see things, not merely in addition (i.e., week after week), but from a new position. We are characters in a marvelous story, and Tolkien firmly believed that the creation and reading of fairy-stories could awaken us to the wonder of reality. This triteness is really the penalty of “appropriation”3: the things that are trite, or (in a bad sense) familiar, are the things that we have appropriated, legally or mentally. We say we know them. They have become like the things which once attracted us by their glitter, or their colour, or their shape, and we laid hands on them, and then locked them in our hoard, acquired them, and acquiring ceased to look at them. Recovery is a concept Tolkien borrowed from G.K. Chesterton (who himself had picked up the idea from Charles Dickens). One dim and cloudy day, Dickens saw the word mooreeffoc on the window of a door. It was a door he had passed many times, but he couldn’t recall having seen that word there before. However, it took him only a split second to realize that he was viewing the word “coffeeroom” from the other side of the pane. In his review of The Lord of the Rings, C.S. Lewis wrote, “This excursion into the preposterous sends us back with renewed pleasure to the actual.”11 Mythology is a form of reification—making something abstract more concrete or real. While we’re talking about looking at things from another angle, let’s look at this issue itself from another angle. This fall I am teaching several sections of a freshman writing course at a community college. One of the standard pieces of writing advice I give to students is to write a draft well before the due date, and then give their brains time to forget about it. What often happens during last-minute “revision” is that the student skips over blatant mistakes because he reads what he thinks he wrote—what he meant to write. But when he comes back to the paper once his brain has relaxed and forgotten, he is able to analyze it, as if for the first time. This is why true “revision” (literally, “seeing again”) requires a kind of template reset. 2 Again, I am using a broad definition of mythology, which includes fantasy, fairy tales, etc. 3 Tolkien’s use of appropriation is different from my use of the word in Part 2. 5 All of the above Tolkien quotes are from “On Fairy-Stories” in The Tolkien Reader (New York: Del Rey, 1986), pp. 77-78. Thanks for this thoughtful piece, Jeremy. Enjoyed it. Reminded me of often, paradoxically, even Christians tend to be antisupernaturalists these days... it's the spirit of our times I guess. In our men's Bible study we've been reading through the Bible and just reached Numbers 5. There's a law of the jealous husband there--for determining guilt or innocence of a wife he suspects of unfaithfulness when there are no witnesses and she denies it. There's a drinking of what we today would see simply as dirty water... water with dust from the tabernacle floor. And then if she's guilty something terrible happens and if innocent, nothing happens. Tell me that doesn't initially strike you on some level as pagan and superstitious. But really it's our modern antisupernaturalist mind kicking in. The accused doesn't drink dirty water. She drinks water mixed w/the dust of the place with the shekinah hovering over it... dust from God's presence. The water is mixed with something more real than dust. Anyway, sometimes I do wonder if the speculative fiction I enjoy reading is escapism from reality or, in a way, escaping to reality. Probably sometimes one, sometimes the other. Thanks for the comment. Yeah, that Numbers 5 passage is fascinating. I hope to cover escape a little more in the next part. The point about supernaturalism and Christians being anti-supernatural reminds me of this video clip from Doug Wilson on "Magic in Literature." I'm sure I'm in the extreme minority, but I struggle with the value of this type of literature at all. I don't see it endorsed (and I've read Bauder's series on it). I'm not convinced - at all. If we are to focus on "what is true" etc., and meditate on the Word day and night, what place does fiction have in our lives? I have a hard time saying Tolkien or Lewis, etc. have true value, or can capture something that is somehow lacking in the Word. How can extended fiction works (not Scriptural analogies or parables) produce something that the inspired Word cannot? I see no hint of this need from Scripture itself. The genre under discussion is a useful tool to to teach character traits such as courage, loyalty, strength of character (and more). Where the Bible says "be of good courage" (and I by NO MEANS mean to indicate that the Bible in itself is insufficient in any way), the books of Tolkien present a character in such a way that many readers respond, "THAT's what a man of courage is like." Remember, the Bible we read is written in Hebrew, Aramaic and Greek. I am sure that, if we knew those languages fluently, and read Scriptural passages - especially the books of History, the Gospels, Acts... - in the original languages, they would be even more exciting than they are in our English translation. On the other hand, there are many people who just don't like this type of literature. (Just as in food, my wife likes liver, and I don't.) There is nothing wrong with that, and I am not here to convince you that you should like this type of literature. God be with us all, and help us to keep one-another sharp. To me, this is a good example of the problem. Using unbiblical, man-generated sources to define Biblical ideas. Often the Bible defines things in ways that our own minds do not (Prov 3:5-6), such as being the least, being weak, etc. I agree. Though I do not know why this would argue in any way for the use of fiction, rather than the increased focus on the Word. Personal appreciation seems to be something not great enough to approve or disapprove of anything. It is our sinful tendency to live by our lusts, wanting and doing what pleases us, rather than what might please God. what role does preaching play? Isn't preaching more than simply restating the Biblical text? Doesn't it involve more than simple exegesis? I think it does. Good preaching doesn't speak where God has not spoken, but it is not simply reciting Scripture either. Warren Wiersbe offers a thorough perspective on the use and exercise of our imagination in communicating biblical truth in his book "Preaching and Teaching with Imagination." In it he argues that we ought to be well read in order to effectively communicate God's Word with sensitivity to the needs of our congregation, and we can often benefit from seeing truth in a new light ourselves. I'm not sure how the comparison relates. Preaching is primarily explaining and applying a text. You know, "preach the Word" and "[teach] them to observe whatever I have commanded you." Preaching certainly would not be the telling of fictitious stories with vague correlations to the truth. To be fair, I have not read Wiersbe's book. I certainly would be interested in knowing the basis for his premise. Jesus certainly used parables to illustrate a truth, but not a volume to weave in things like this series discusses. It seems that Paul and other biblical writers were familiar with extrabiblical literature. Have you ever used an illustration not found in the Scriptures to explain the passage under discussion? Have you ever used a visual aid not specifically described in Scripture to help people understand the Word? Have you ever used a personal testimony of an experience to praise and worship the Lord? In the IFB churches I have been a part of, this has been an acceptable part of the ministry, but obviously it (our personal experience) is not found in Scripture. All that being said, I would NEVER use an illustration out of the type of literature being discussed as an illustration in the pulpit. While Tolkien, C. S. Lewis, John Bunyan, and scores of others have written books which elaborate desireable character traits, the triumph of good over evil, etc., I would not use them in a sermon, or as a book study in a church setting. To answer your three questions - yes. However, I think using "an illustration not found in Scripture" is missing the point of this series, and at least my argument. How does that relate to focusing on a large work of fiction (hence, is not true) that itself has to be interpreted? One is a self-standing, made-made work, not necessarily created for explaining (or even illustrating) truth. The other, the Word of God which we are commanded to learn, meditate upon (as opposed to other things like fiction? ), and live. God never included such works in Scripture. What did He miss by not doing so? Odd to see telling the truth pitted against fictional stories as though there was some kind of tension between them. Fictional stories tell the truth quite often. Jesus did it quite often in parables. The burden of proof falls on the anti-fantasy position to show that fantasy fiction is different from parabolic fiction--sufficiently different to demonstrate that it cannot be a suitable vehicle for telling the truth. I've read the Lord of the Rings twice. It did me a great deal of good as a teenager. There is much truth in it. 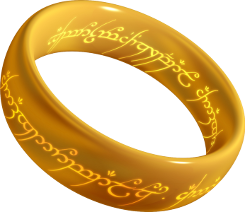 For starters, the beauty of heroic sacrifice, the allure of power, the danger of deception by degrees (Wormtongue vs. that king of Rohan guy), the danger of technology even when devised with good intentions (the whole ring saga), on and on it goes. It rings true (no pun intended) all over the place. I have used these as sermon illustrations. Can't see any reason not to other than lack of familiarity with some of the audience--and then you have too much story telling to do. Other than that . . . if stories are good enough for Jesus, who am I to say they're unfit for the pulpit? Nothing that Jesus used remotely resembles The Lord of the Rings. God wrote the majority of the Bible in chronology and prescription. He did not write us an allegory to decipher (we have enough trouble with clear revelation, don't we?). The Bible is inspired (including what Jesus said). That is a HUGE distinguishing characteristic from what you suggest. Apples versus [uninspired] oranges. Man's works are full of holes (Pilgrim's Progress has many of them, for example). Fictional works have no redeeming value whatsoever without accurate understanding of Scripture. It is open to major fallacy and pseudo-application. They also may be given more weight than their authors even intended. I'm happy with the Bible as my source of truth. I'm glad to use illustrations, etc. but I will not lift up man's work to a level which is seen to somehow enhance Scripture (which it cannot do), nor distract people from what they should be meditating on by redirecting their attention to man's works. What is the scope of your comments? Is it Universal? Just thought that would help us understand where you are coming from. The best fiction does tell the truth. The setting may be futuristic or other-worldly, but when it isn't consistent with what we know to be true about the human condition, we feel that and reject it as being of poor quality. That is, unless one has the IQ of a cabbage. There's plenty of that going around, but those folks aren't reading the Bible anyway. Fiction is also a way to experience a life other than one's own, and gain perspective from another POV. It is an enjoyable way to learn about other cultures and times. We can exercise critical thinking by deconstructing themes and metaphors. However- reading fiction doesn't help me understand the Bible any better. The work of the Holy Spirit is what interprets and guides and informs my understanding of Scripture. On a side note, just because a book is in the nonfiction section doesn't make it factual. One of my favorite authors is Neil deGrasse Tyson, and it's safe to say that much of what he writes is either theoretical or pure fantasy. I can say that I gain an appreciation for the complexities of the universe by reading his stuff though. People spend their 'down time' doing something. Reading has a quantifiable, beneficial, physical effect on the mind and body, and is a healthy way to spend time relaxing. If reading fiction develops the intellect, it is a worthwhile endeavor. I will not. . . distract people from what they should be meditating on by redirecting their attention to man's works. Do you read non-Biblical story books to your kids? I think I have answered your first question already. I believe the scope of this is an affirmation of fictional works as a means of teaching (and even study - hey we're on part SIX of this series). The series, if I can gather it to some degree (I've only read this part) lauds the writing and use of fiction as a means of teaching the truth. I see nowhere in the Bible that this is commanded, encouraged, or illustrated (I've already stated that they no way resemble parables). We quote Tolkien, Chesterton, Cleanth, and Lewis to prove our points, but not the Bible. Why? Isn't that supporting the greatness and use of extra-biblical writings by extra-biblical writings? If the Bible doesn't present this as a practice, encourage this as a practice, or present Itself in such a way, on what basis should I pursue it? I have not seen anywhere in Scripture where I am to write such things or study the works of others in order to know God or His Word better. Is it wrong to read newspapers? Any other sources? That is not the scope of the discussion. I read this article, so I think you can answer many of these questions on your own. I do not read newspapers (OK, news web sites, etc.) to understand the Bible. I do read the Bible to help me have a right understanding of what I read in newspapers, etc. Is it wrong to read [insert your list]? I would answer by saying that we are commanded to meditate on the Word day and night (Psalm 1:1-3; Psalm 119; Joshua 1:8-9, etc.). Does the Word forbid other reading [I'm a non-fiction guy myself...]? No (you didn't mention STOP signs...). It does, though, place a preeminent focus and priority of time upon the Word of God. If we are experts in [name your fictional novel, past time, sports event, movie character, etc.] and not the Bible, that should indicate a wrong focus, wouldn't you say? If we do not meditate on the Word, however you decide to reason through it, we have ceased to focus upon what God has indeed told us to fix our attention upon. The Word does say that it is complete, and able to complete us for every good work. That sounds wholly sufficient to me. For someone to say that we need some method of writing outside of the Word seems to diminish the Word. I would like to see you present your arguments / support your statements from Scripture. I can put any number of 'down time' activites in your paragraph in place of reading and justify most anything from your logic. If you argue that reading helps us learn to think, helps our imagination, stimulates our thinking, I'm on board. Fiction is not inspired, and often clouds or distorts reality rather than reinforces it. Whether or not I can do it a great deal and still mediate on God's Word, or think on things that are true is another argument. Reading has a quantifiable, beneficial, physical effect on the mind and body, and is a healthy way to spend time relaxing. Just curious how reading benefits the body? I understand the mind, imagination and intellect, just not clear about how reading in of itselfs does to benefit the body. Sure you can relax while doing it but that doesn't mean the reading is beneficial to the body, but the relaxation that is beneficial. I would like to see you present your arguments / support your statements from Scripture. I can put any number of 'down time' activities in your paragraph in place of reading and justify most anything from your logic. I don't understand what you are objecting to, but maybe I can clear some things up. First, I don't believe one can put 'any number of activities' in place of reading, since 'any number of activities' are already dealt with specifically in their own right. IOW, you can't substitute 'getting drunk' or 'torturing puppies'. You could, I suppose, substitute another allowable activity, such as golf or checkers or building a tree fort or knitting sweaters, as all these things are not only allowable, but have actual physical or mental benefits. Just don't use the knitting needles to stab your mother-in-law. I did not say or imply that fiction is inspired. I do not equate reading fiction to reading Scripture. Perhaps you missed the part where I said "...reading fiction doesn't help me understand the Bible any better. The work of the Holy Spirit is what interprets and guides and informs my understanding of Scripture." Reading the Bible informs our lives- our relationships, our vocations, our ministries, our recreation, not the other way around. I don't propose nor would I agree with anything said to the contrary. I don't read fiction to refresh my mind, I read the Bible to refresh and readjust my thinking. Reading fiction can be a good thing if we treat this activity with the same thoughtfulness and purpose with which we should endeavor to approach everything, even relaxation. Perhaps I should say especially relaxation, which is when we tend to let our guard down. "Relax" doesn't have to mean 'vegging out' or dropping our moral boundaries. Benefits of reading include reducing stress, increasing mental acuity, broadening the vocabulary, improving writing skills, sharpening the memory, and there are studies that indicate it can slow the progress of the mental deterioration we experience as we age. These are all positive things that are beneficial in every area of our lives. Bro. Subra- you are obviously not in danger of becoming coleslaw. You know the difference between Herman Melville and E. L. James. I am certainly NOT advocating that every book in the universe is equally useful, informative, or of the same literary quality. Late and maybe redundant, but . . . . The relevance of description vs. prescription depends on what one's claim is. If we're claiming a biblical requirement to X, we'd need prescriptive passages to support it rather than descriptive ones. If we're claiming that X is permissible, descriptive is sufficient. 1. Nothing that Jesus used remotely resembles The Lord of the Rings. God wrote the majority of the Bible in chronology and prescription. He did not write us an allegory to decipher (we have enough trouble with clear revelation, don't we?). 2. The Bible is inspired (including what Jesus said). That is a HUGE distinguishing characteristic from what you suggest. Apples versus [uninspired] oranges. Man's works are full of holes (Pilgrim's Progress has many of them, for example). 3. Fictional works have no redeeming value whatsoever without accurate understanding of Scripture. It is open to major fallacy and pseudo-application. They also may be given more weight than their authors even intended. This one depends on what "redeeming value" means. We were created in God's image so that, like Him, we would--among other things--imagine and create. So even a lost person who enjoys an imaginative work is, in a small way, being what God made him to be. Personally, I think it's a mistake to look at fiction strictly in terms of its message. I've seen lots of Christian writers go that route. The creative act and the act of experiencing story are good things in themselves, other things being equal. But even if we suppose fiction is worthless to those who aren't biblically informed, the claim that it has value for those who are biblically informed stands. I'm happy with the Bible as my source of truth. So are we all. The question is whether God has put 100% of the truth that exists in the pages of the Bible and 0% anywhere else. I don't think you'd want to take that position. But if there is even 1% somewhere else, we should pursue that 1%. ... nor distract people from what they should be meditating on by redirecting their attention to man's works. The assumption here is that man's works must distract and cannot add to our understanding. Doesn't fit Paul's use of secular poets in his speaking and writing (see Titus 1). And the act of preaching itself--as someone mentioned upthread--is human work. We don't just read Scripture for an hour. We add our perspective and experiences into our delivery as an aid to understanding. Scripture has to be hitched to Life if we're going to use it faithfully. That involves understanding both Scripture and Life. Stories of all sorts help a great deal with the latter. And so our point of disagreement is...? I think I have answered your first question already. I believe the scope of this is an affirmation of fictional works as a means of teaching. All that being said, I would NEVER use an illustration out of the type of literature being discussed as an illustration in the pulpit. While Tolkien, C. S. Lewis, John Bunyan, and scores of others have written books which elaborate desirable character traits, the triumph of good over evil, etc., I would not use them in a sermon, or as a book study in a church setting. So I am now going to shut up and bow out. I do not disagree. I just think that the emphasis placed upon fiction in this thread far exceeds its true value and seems to indicate a heavy focus upon it rather than the Word. Too much of anything takes us away from our required attention to the Word. I know who Edgar Rice Burroughs is. :>D Fascinating reading back in the day (but a real waste of time as I look back). I encourage people to read biographies, histories, and non-fiction, hoping that they receive some of the same benefits you suggest with a higher level of benefit. How Do You Interact with Someone Who Uses the Word "Subgenre?" This is where I start sounding stupid and uneducated. I disagree with this dual standard. God had 1500 years and 66 books (in English) to relate His means of relaying truth. He did not do it via a novel. Jesus spoke directly, and used no more than short stories to illustrate specific truths. We are to preach the Word, not someone's novel that weaves the truth in by means of the mind of man. I will repeat, nothing Jesus used remotely resembles a multi-volume fictional work like LoTR. Small and direct, versus long and opaque is quite a difference. (My son would argue about the allegorical content of LoTR, and I'd probably say it would be easy to understand it allegorically.) Omission is not permission, either, I'd say. Aaron, we are suggesting and encouraging people to read this type of fiction because in some way the Scripture as it stands is insufficient and needs this effort to explain it. That is not found in Scripture, and it really defies what Scripture does say ("thoroughly furnished unto all good works"). It also gives more credit to a work of man that deserves our time and focus. We are to rightly divide the Word, not Tolkien. We are not talking hymns (non-fiction, which often repeat doctrine in metered form), textbooks (non-fiction, which explain the Word much like a sermon), and poetry (depends upon the context). I have to disagree. Unless man's imagination is first taught and tempered by the Word, the "creative act and the act of experiencing story" are not "good things in themselves." Man's imagination is evil from his youth (Gen 8:21). We have deceitful and desperately wicked hearts (Jeremiah 17:9). To be honest, though I understand what you say about the image of God involving imagining and creating, i don't find that clearly defined in Scripture, do you? I do find that we should reflect him. We certainly can imagine, design, etc., but apart from the influence of the Word and the proper focus on the Creator Himself, it is just another form of idolatry, worshipping the creature rather than the Creator. The Word defines what truth is. You still have to start and end with the Word, or you cannot identify what is true. (And fiction is not a source of truth, by definition, I would think.) And we are still told to meditate on the Word day and night, to rightly divide the Word, to preach the Word, etc. That seems to have some weight, doesn't it? I don't argue using illustrations if the truth is the central focus. If you want to read a volume-length story and study it at length, as opposed to studying the Word directly, I'd pass. Paul's references to secular writers doesn't validate this conversation. He acknowledges their existence. He leverages a short comment. He does not turn and suggest to study the works, seeking what truth may be found there. When I suggest that man's work distracts, it can easily do so by mere logistics. Time spent on something else is time spent away from 66 books that God did give for doctrine, reproof, correction, and instruction in righteousness. I don't know about you, but I'm still a bit shy from the comfortable mark on my knowledge of those 66 books. I think of Luke 8 which talks about the cares, riches, and pleasures of this life which choke us and prevent us from bringing fruit to maturity. I think of redeeming the time because the days are evil. I think that we are to meditate on the Word day and night. It sure appears to me that distraction is very, very possible (not just from reading - it could be from spending too much time on SI ;>D). For what it is worth, I like Les Miserables. I read the abridged version in high school. I saw the Broadway musical a couple of times. I listened to the 62 hour unabridged audio version. I found it fascinating in many ways. (The priest as the hero of the book occupies 10-12 chapters before Jean Valjean even is mentioned.) I enjoy the music too. However, the entire book only has meaning as I understand what the Word says. I cannot preach the story - there are way too many falsehoods in the midst of the noble intentions. I might take a slice of one moment as an illustration - explaining the context a bit first - and then use that to illustrate a point. I would never use Les Miserables (or LoTR, or Chronicles, etc.) as a text to try to teach the truth. That is backwards. The Word is much to rich to leave it for something that can only pale in comparison. Several people on this thread have suggested that, whatever the merits of fiction, it does not help one read the Bible better. Kevin Subra's bit about newspapers calls into question whether even (purportedly) non-fiction books can help one read the Bible better. Susan contrasted the illumination of the Holy Spirit to the process of reading. I believe that extra-biblical works, both fiction and non-fiction, can help one be a better Bible reader, and that this help in no way competes with the Holy Spirit. That doesn't necessarily mean that any work WILL help someone. He has some points worth making. First, people who are reading the Bible are, well, reading. How did they learn to read? Someone taught them. So, there can never be an absolute separation between general knowledge and scriptural interpretation. I would extend the point further. Being a good Bible reader shares many attributes in common with being a good reader in general: thoughtfulness, attention to detail, genre recognition, empathy, etc. How are these developed? Usually by reading other books. Almost all Christians believe that the historical and grammatical contexts matter for interpretation. But how does one understand a word that is used only once in the Bible? Perhaps the context makes the meaning beyond doubt, but often one is forced to draw from the broader corpus of Hebrew or Greek literature. If there were not some people who read many other books, one would not even have a reliable English translation to read. How does one make sense of an obscure practice in the Bible? Cultural histories can reveal to us the meaning that would have been obvious to the original reader. Also, if one acknowledges the necessity of orally teaching about Scripture, any objection to written forms of that teaching seems hypocritical. As for fiction, many of the genres that make up the Bible are what we would today call literature, or are at least heavily imbued with literary qualities. A good bit of the Old Testament is poetry. Some resembles epic. There are psalms. Many of the genealogies, annals, and covenantal codes are shaped by ancient near eastern genre expectations. (A great resource on this is Ancient Near Eastern Thought and the Old Testament by John Walton.) So, if ancient or modern fiction can help one become a better reader of a genre, the skill is transferable. As for the Holy Spirit, I don't think it does well to pit him against "natural" skills, though his role extends beyond them. I don't think Susan meant to do such a thing, but it behooves us to be careful about our disjunctive statements. Glad you made that point, Charlie. I agree whole-heartedly. I became a serious reader of poetry about 6 years ago, and it has helped me immensely in my reading and interpreting the Bible. To further clarify- reading fiction or nonfiction hones our reading skills, and therefore can help us understand the Bible. I was trying to make a distinction between interpreting Scripture on a spiritual level and an intellectual level. This could be similar to studying to be a better mechanic, if that was one's vocation, as excellence should be a part of a Christian's testimony. (Whatever thy hand findeth to do ...) Everything we do to better ourselves for the work of the Lord is 'spiritual' in that sense. I didn't and don't propose that our intake of fiction/nonfiction, secular or otherwise, takes the place of or diminishes our reading and studying of Scripture. But we need to be careful about saying that we should spend more time reading the Bible than we do anything else. Who else has a job and needs more than 2 hours of sleep a night? Does God expect us to neglect our families or take an extra-long lunch break or call in sick to spend time studying the Bible? Of course not. I am assuming an audience that understands extremes or abuse of liberty are not being promoted here. The thread focuses on fiction, but I also recommend reading nonfiction, and it's safe to say I read much more nonfiction than fiction, even with the YA book reviews that I do for one of my blogs. But nonfiction, as I have mentioned, is not automatically better than fiction. Some fiction is more 'factual' and thought provoking than nonfiction. It really depends on the skill and intent of the author. I'm curious. Are there any pursuits or activities which do not constitute Bible reading or study that are worthwhile in your view? I know that you have been arguing against reading fiction, but it seems that your arguments are generic enough to be applied to almost every activity a Christian might engage in.